Gómez, R. & Vannini, S. (2015): Fotohistorias: Participatory Photography and the Experience of Migration. Seattle, WA. CreateSpace Independent Publishing. ISBN: 978-1517464660. Buy on Amazon – Download the PDF. All proceeds go to Casa Latina. Featured among the “Teaching about Migration using Critical Social Analysis” curricular resources for upper level high school students for public schools in the USA. Vannini, S., Gomez, R., Carney, M. A., Mitchell, K. (2018). Interdisciplinary approaches to refugee and migration studies: Lessons from collaborative research on sanctuary in the changing times of Trump. Migration and Society (Vol. 1,1). Franco Silva, L., Vannini, S., (submitted). Communicating a difficult past: Social Representations of the “Bahia Portete Massacre” in the Colombian digital media. Bentley, C., Nemer, D., Vannini, S. (2017). “When words become unclear”: unmasking ICT through visual methodologies in participatory ICT4D. Special Issue on Cultural Diversity and Community Technology Design, for the Springer Journal AI & Society. Vannini, S., Nemer, D., Halabi, A., Sabiescu, A.G., David, S. (2017) Critical Incidents Analysis: mismatching expectations and reconciling visions in intercultural encounters. The journal of Community Informatics, Vol 13, No 2, Special Issue: CIRN Conference, 2016. Carney, M. A., Mitchell, K., Gomez, R., Vannini, S. (2017) Sanctuary Planet: A Global Sanctuary Movement for the Time of Trump. Environment and Planning D: Society and Space. Gomez, R., Vannini, S. (2017) Neither here nor there: notions of home and sense of belonging in the context of migration in a journey through participatory photography. The Electronic Journal of Information Systems in Developing Countries (EJISDC), 78. Halabi, A., Sabiescu, A.G., David, S., Vannini, S., Nemer, D. (2015). From Exploration to Design: Aligning Intentionality in Community Informatics Projects, the Journal of Community Informatics – Special Issue: Research Methods for Community Informatics, 11, 3. Vannini, S., Rega, I., Sala, S., Cantoni, L., (2015). Using Photo-elicitation to Explore Social Representations of Community Multimedia Centres in Mozambique. The Electronic Journal of Information Systems in Developing Countries (EJISDC), 67,8. Baia A., Macueve G., Rega I., Cumbula S. D., Vannini S., Cantoni L. (2014). Social Representations of Multimedia Community Centers (CMC) in Mozambique. Revista de Ciências Socias e Humanas, CEA, Vol. 23 (Estudos Moçambicanos), Issue 3, pp. 95-115. Rega, I., Vannini, S., Fino, E., Cantoni, L. (2013). Exploring the Meanings of Community Multimedia Centers in Mozambique: A Social Representations Perspective. Information Technology and International Development, (ITID), 9,4, pp 35-54. Vannini, S., Rega, I., Cantoni, L. (2013). Information and Communication Flows through Community Multimedia Centres: Perspectives from Mozambican Communities. Information Technology for Development (ITD), pp. 1-14. DOI:10.1080/02681102.2013.854729. Rapetti, E., Picco-Schwendener, A., Vannini, S., (2011), Is mobile learning a resource in higher education? Data evidence from an empirical research in Ticino (Switzerland). Journal of e-Learning and Knowledge Society – EN, Vol. 7, n. 2, May 2011, pp. 47 – 57. Rapetti, E., Picco-Schwendener, A., Vannini, S., (2011), Mobile Learning: una risorsa nell’educazione universitaria? Risultati da una ricerca in Ticino (Svizzera). Journal of e-Learning and Knowledge Society, Vol. 7, n. 2, May 2011. Cantoni, L., Rapetti, E., Tardini, S., Vannini, S., Arasa, D., Ruiz, L., (2012), Sacerdoti e Internet: la ricerca internazionale PICTURE, in Tapia-Velasco, S. (eds. ), La Comunicazione nella Missione del Sacerdote, Edizioni Sabinae, Roma 2012, pp. 93-121. Vannini, S., Rega, I., Cantoni, L. (Eds.) (2018) Social Representations, ICTs and Community Empowerment. [Special section]. Semiotica. Stillman, L., Sabiescu, A., & Vannini, S. (Eds.) (2014) Proceedings of CIRN 2013 Community Informatics Conference: “Challenges and Solutions”. Prato, Italy, 13-15 Oct. 2014. Vannini, S., Gomez, R., Lopez, D., Mora, S., Morrison, C., Tanner, J., Youkhana, L., Vergara, G., Moreno Tafurt, M. (2019). Humanitarian Organizations Information Practices: procedures and privacy concerns for serving the Undocumented. The 15th International Conference on Social Implications of Computers in Developing Countries – IFIP W.G. 9.4 Conference, Dar es Salaam, Tanzania, 1 – 3 May 2019. Vannini, S., Gomez, R., Newell, B.C., (2019). Documenting the Undocumented: Privacy and Security Guidelines for Humanitarian Work with Irregular Migrants. In iConference 2019, Washington, DC, USA, March 31 – April 3, 2019. Selected as one of five finalists for the 2019 Lee Dirks Award for Best Full Research Paper. Vannini, S., Nemer, D. Rega, I. (2017) Integrating mobile technologies to achieve community development goals: the case of telecenters in Brazil. 8th International Conference on Community and Technologies (C&T) 2017, Troyes, France, 26-30 June 2017. Vannini, S., Nemer, D., Halabi, A., Sabiescu, A.G., David, S. (2016) Critical Incidents Analysis: mismatching expectations and reconciling visions in intercultural encounters. Proceedings of CIRN 2016, Engaging with Participation, Activism, and Technologies, November 2 – 4, 2016, Monash Centre, Prato Italy. Vannini, S., Gómez, R., Guajardo, V. (2016), Security and Activism: Using participatory photography to elicit perceptions of Information and Authority among Hispanic migrants in the U.S., in iConference 2016 Philadelphia, PA, USA, 20-23 March 2016. Guajardo, V., Gómez, R., Vannini, S. (2016), Information and Learning: Trust, Place, and Migration, in iConference 2016 Philadelphia, PA, USA, 20-23 March 2016. Halabi, A., Sabiescu, A.G., David, S., Vannini, S., Nemer, D. (2014) From learning to designing action: Uncovering obscure processes in participatory community-based research, Proceedings of CIRN 2014 Community Informatics Conference: Challenges and Solutions, Monash Centre, Prato Italy 13-15 October 2014. Pucciarelli, M., Vannini, S., (2014) Mapping the digital Douala: lights and shadows of an African City, Proceedings of CIRN 2014 Community Informatics Conference: Challenges and Solutions, Monash Centre, Prato Italy 13-15 October 2014. Vannini, S., Rega, I., Sala, S., Cantoni, L. (2013). Motivations of non-use of telecentres: a qualitative study from Mozambique. in Proceedings: 2013 Pre-ICIS Workshop of the AIS SIG on ICT & Global Development (GlobDev). Milan, Italy, 14 December, 2013. Van Zyl, I., Vannini, S. (2013). Participatory re-action: reflecting on a Design-Based Research approach in ICT4D, in Steyn, J., Van der Vyver, A.G. (eds.). (2013). Public and private access to ICTs in developing regions. Proceedings of the 7th International Development Informatics Conference IDIA 2013. Bangkok, Thailand, 1-3 November, 2013. Pp. 206-223. ISBN: 978-0-620-58040-3. Vannini, S., Rega, I., Sala, S., Cantoni, L. (2013). Reasons of non-use: a study on Mozambican telecentres, in Steyn, J., Van der Vyver, A.G. (eds.). (2013). Public and private access to ICTs in developing regions. Proceedings of the 7th International Development Informatics Conference IDIA 2013. Bangkok, Thailand, 1-3 November, 2013. Pp- 46-63. ISBN: 978-0-620-58040-3. David, S., Vannini, S., Sabiescu, A. G., Cantoni, L. (2013). Commitment, Proactivity and Trust: Ingredients for Successful Cooperation in Community Development Actions. Proceedings of CIRN 2013 Community Informatics Conference: Community Archives meets Community Informatics, Monash Centre, Prato Italy 28-30 October 2013. Vannini, S., Aguirre, L., Rega, I., Cantoni, L. (2013). Images of Community Multimedia Centres in Mozambique: a participatory photo-elicitation study, in Proceedings: IFIP WG 9.4: 12th International Conference on Social Implications of Computers in Developing Countries, Ocho Ríos Jamaica, 19-22 May, 2013, pp. 348-362. Aguirre, L., Vannini, S., Rega, I., Cantoni, L. (2013). Fictional Characters, Real Data: Personas depicting Staff and Users of Community Multimedia Centres in Mozambique, in Proceedings: IFIP WG 9.4: 12th International Conference on Social Implications of Computers in Developing Countries, Ocho Ríos Jamaica, 19-22 May, 2013, pp. 917-933. David, S., Rega, I., Vannini, S., Cantoni, L. (2013). Co-designed improvement actions in Mozambican Community Multimedia Centres, in Proceedings: IFIP WG 9.4: Social Implications of Computers in Developing Countries, Ocho Ríos Jamaica, 19-22 May, 2013. Short Paper, pp. 1004-1017. Vannini, S., Rega, I., (2012), Inbound and Outbound Information and Communication flows: Perspectives from Community Multimedia Centres in Mozambique, in Proceedings: CIRN 2012 Community Informatics Conference: ‘Ideals meet Reality’ Monash Centre, Prato Italy 7-9 November 2012. 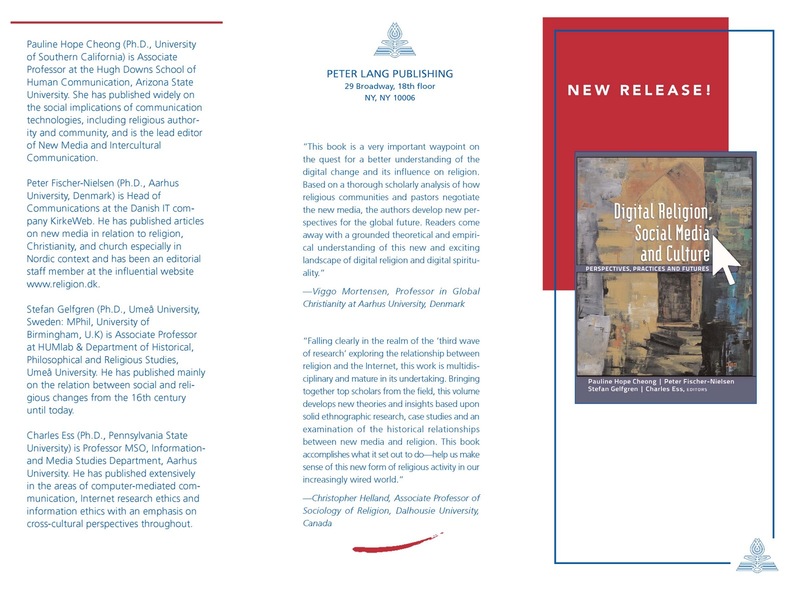 Cantoni, L., Rapetti, E., Tardini, S., Vannini, S., Arasa, D., Ruiz, L., (2012), Priesthood and the Internet: the International Research PICTURE, in La Porte, J. M., e Mastroianni, B., (eds. ), Comunicazione della Chiesa. Identità e Dialogo, Proceedings of the 7th Professional Seminar for Church Communications Offices, Edizioni Sabinae, Roma 2012, pp. 227-246. Sala, L., Vannini, S., Rubegni, E., (2011), Mobile Learning in Cultural Institutions through the use of an Apple iPad application prototype. A case study at Monte Verità, in Proceedings of Red Conference 2011, Monte Verità, Ascona, Switzerland. Vannini, S., & Gomez, R. (2019) Participatory Photography To Elicit Lived Experiences With Undocumented Migrants And Humanitarian Organizations. in Lopez, D., Gomez, R., Vannini, S., Chin, A., Yefimova, K., Iribe Ramirez, I. Panel: Building Empathy and Understanding Toward Migration through Games and Creative Activities. Association for Borderlands Studies Conference 2019, San Diego, CA, 24-28 April 2019. Hannah, J., Wensley, M., Kelly, A., Vannini, S. (2019) Creating Coherence and Intellectual Culture with Integrated Assignments Across the Curriculum. 2019 UW CTL Teaching and Learning Symposium. Seattle, WA, 17 April 2019. Vannini, S., Gómez, R., Newell, B. C., (2019) Privacy and Security Guidelines for Humanitarian Work with Irregular Migrants. ICTDX – ICTD Conference 2019, Ahmedabad, India, 4-7 January 2019. Bentley, C., Nemer, D., Vannini, S. (2019) “When words become unclear”: unmasking ICT through visual methodologies in participatory ICT4D. ICTDX – ICTD Conference 2019, Ahmedabad, India, 4-7 January 2019. “Previously published” track. Newell, B. C., Vannini, S., Gómez, R., Nemer, D. (2018) Exacerbating the Vulnerabilities of Undocumented Migrants: The Risks Involved in the Humanitarian Information Activities of Migrant-Aid Organizations. iConference 2018, Sheffield, UK, March 25-28, 2018. Vannini, S. (2016) Innovating Public Access for the next two billion: the challenge of Mobile Information Literacy. Contribution to Open Session “Workshop on ICTD Innovation across countries to be held at ICTD2016”. ICTD Conference 2016, Ann Arbor, MI, USA, 3-6 June 2016. Guajardo, V., Vannini, S. & Gomez, R. (2016). Panel: Engaged Research and Vulnerable Communities & Lessons from Fotohistorias. Association for Borderlands Studies Annual Conference. Reno, Nevada. Pucciarelli, M., Vannini, S., Cantoni, L. (2016), The production of an African hybrid city, in “An Informational Right to the City? Rethinking the Production, Consumption, and Governance of Digital Geographic Information” session, at the Annual Meeting of the Association of American Geographers, San Francisco, 29 March – 2 April 2016. Gómez, R., Guajardo, V., Newell, B., Vannini, S., Yefimova, K. (2015) Open Session: Photo Stories: an interactive photo exhibition based on participatory photography with Hispanic migrants at the US-Mexico border, at ICTD 2015, Singapore, 13-15 May 2015. Gómez, R., Guajardo, V., Newell, B., Vannini, S., Yefimova, K. (2015) Fotohistorias: Life at the Border, Exhibition, at Association of Borderland Studies ABS/WSSA Annual Conference, Portland, OR, 8-11 April, 2015. Cantoni, L., Sabiescu, A., Brunello, P., David, S., Vannini, S. (2013), Open Session: ICTD – Intercultural Communication Technologies for Development, at ICTD 2013, Cape Town, South Africa, 7-10 December 2013. Sabiescu, A.G., Vannini, S., David, S., Cantoni, L., Halabi, A. (2013). Workshop: Methodologies for sense-making in community-based research. (slide) at CIRN 2013 Community Informatics Conference: Community Archives meets Community Informatics, Monash Centre, Prato Italy 28-30 October 2013. Vannini, S., Pucciarelli, M., Rega, I. (2013). Formal and Informal Learning Practices in Community Multimedia Centres in Mozambique (slides). Annual Conference of the Swiss Society for Research in Education – SSRE 2013 on Integrating formal and informal learning, August 21-23, 2013, Università della Svizzera italiana, Lugano, Switzerland. Vannini, S., (2012), Role Play on Social Representations of the Model of Community Multimedia Centres (video 1, video 2), IPID 2012 7th International Annual Symposium, Kristiansand, Norway. Best Role Play Award. Vannini, S., Rega, I., Cantoni, L., (2012), Social Representations of Community Multimedia Centres in Mozambique, 11th international Conference on Social Representations – CIRS 2012, Évora, Portugal. Rega, I., Vannini, S., Cantoni, L., (2012), Community Multimedia Centres in Mozambique: blending new and old media. A photo-semiotic study., at ICT, New Media and Social Change in Africa, London, UK. Cantoni, L., Rega, I., Vannini, S., (2012), Open Session: “Photo Elicitation Techniques to Support Research Projects in the Communities” (slides on application and first results), ICTD 2012, Atlanta, USA. Vannini, S., (2011), Perspectives from Mozambican Community Multimedia Centres, IPID 2011 Symposium, Lugano, Switzerland. Best Presentation Award. Rega, I., Vannini, S., (2011), How is Education fostered by PAVs and CMCs in Mozambique? eLearning Africa 2011, Dar es Salaam, Tanzania. Vannini, S., Rega, I., (2010), RE-ACT, IPID 2010 Symposium, Barcelona, Spain. Cantoni, L., Tardini, S., Rapetti, E., Vannini, S.,(2010), The use of ICTs by Christian Catholic Priests: Canada Compared Against the World PICTURE, Conference on Media, Religion and Culture 2010, Toronto, Canada. Cantoni, L., Tardini, S., Rapetti, E., Vannini, S.,(2010), PICTURE Priests’ ICT Use in their Religious Experience, “7th Professional Seminar for Church Communications Offices”, PUSC, Rome, Italy). Vannini, S. & Gomez, R. (2018). We Need Digital Sanctuaries across Borders. Human Centered Computing Across Borders. June 2018. Vannini, S. & Gomez, R. (2018). We Need Digital Sanctuaries for Development in the USA, too. ICTWorks.org. May 2018. Rega, I., Vannini, S., Raimilla, M., Fauró, L. (2013). Telecentres and Mobile: an initial overview. Associazione seed technical report, ver. 1.0. October 2013. Rega, I., Cantoni, L., Vannini, S., David, S., Baia, A., Macueve, G., (2013) Centros Multimédia Comunitários em Moçambique: um mapa. NewMinE Lab Working Paper, Ver. 1.1, March 2013. Vannini, S., Rega, I., Cantoni, L., Aguirre-Sánchez, L., (2012), Photo-elicited perceptions of Community Multimedia Centres in Mozambique., NewMinE Lab Working Paper, Ver. 1.0, November 2012. Rega, I., Cantoni, L., Vannini, S., David, S., Baia, A., Macueve, G., (2011) Community Multimedia Centres in Mozambique: a map. NewMinE Lab Working Paper, Ver. 1.0, December 2011. Vannini, S., Cantoni, L. (2010), Mobile devices to raise cultural awareness (1st presentation; 2nd presentation), International workshop on mobile science, Abdus Salam International Centre for Theoretical Physics (ICTP), Trieste (Italy). Vannini, S. (2006). I Mapuche in Cile: esperienze di recupero della cultura locale (The Mapuche in Chile: Experiences of local culture preservation), Laurea (MA) Thesis. Supervisors: Prof. PhD Carlo Cencini, Prof. PhD Giovanni Gentile Marchetti. Alma Mater – Università di Bologna, Bologna, Italy. PhD progresses “Community Multimedia Centres in Mozambique: a contribution from the Theory of Social Represerntations” at the CrossField ProDoc School fourth residential seminar, Serpiano (CH), 19-21 August 2013. SPARK 2013, the 4th Global Forum on Telecentres, Granada, Spain, 28-29 May 2013. PhD progresses Social Representations of Community Multimedia Centres in Mozambique and Actions for Improvement at the CrossField ProDoc School third residential seminar, Co-located with the Alpine Rendez-vous 2013, Villard-de-Lans, France, 28-30 January 2013. PhD progresses Social Representations of Community Multimedia Centres in Mozambique at a TASCHA TALK, TASCHA Group, Information School, University of Washington, USA, 9 August 2012. PhD progresses Community Multimedia Centres: Perspectives from Mozambique at the CrossField ProDoc School first residential seminar, Brusata di Novazzano, Switzerland, 5-9 February 2012. First UNESCO Symposium on Mobile Learning, UNESCO Headquarters, Paris, France, 15-16 December 2011. 2011 North-South Centre Annual Conference – Denkplatz Entwicklung – ICT4D – The development impact of information and communication technologies, Zurich, Switzerland, 10 November 2011. 2011 Annual Conference of the KFPE, Bern, Switzerland, 9 November 2011. Presented Izak Van Zyl’s and Isabella Rega’s paper “Critical approaches and varied impacts. Understanding the role of educational technology in disadvantaged schools” at the IDIA 2011 annual conference, Lima, Peru, 26 – 28 October 2011. PhD topic and progress at the PhD session organized by Prof. Erkki Sutinen at the Ministry of Science and Technology in Maputo, Mozambique, 18 March 2011. Conferência Nacional dos Centros Multimedia Comunitarios, Maputo (Moçambique), 1-3 December 2010.